Katzentisch: Want to come to the Martinsmarkt? Want to come to the Martinsmarkt? OK, Etsy is going. In between I'm doing other stuff. Invitation cards for my favourite flower shop for example. 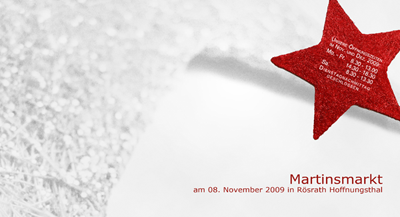 On 8th November 2009 there will be Martinsmarkt in Hoffnungsthal, a small village not too far from Cologne. On that Sunday all shops along the main street are opened. There will be stands on the town hall square offering delicious wine and food and the first Christmas decoration. In the town hall you can get coffee and cake and visit some exhibitions. It's a small but fine market. 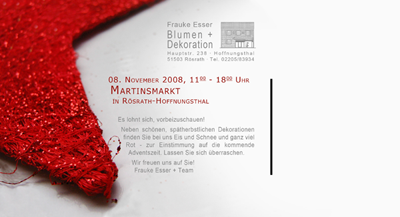 Frauke, the flower shop owner sends invitation cards for this event to her customers and it's me to design these cards. The theme varies every year. This year it is ice, snow and deep red Christmas items. I like how it turned out. Cool, icy and with that hint of deep red Christmas. You should browse Frauke's shop for this colour combination on Martinsmarkt. Did you realise that the date printed on the back of the card is wrong??!! It says 2008 but of course it should read 2009! Oh my God! It's definitly my fault. When I saw this all cards had been send out already - and nobody, neither Frauke nor her customers had seen this mistake! Unbelievable! It's one of those typical mistakes you make. You double check it again and again - but the most simple faults you don't see. Hell!